SpongeBob SquarePants – From SpongePedia, the biggest SpongeBob-wiki in the world! SpongeBob SquarePants is the main character of the Nickelodeon animated series SpongeBob SquarePants. He was designed by marine biologist and animator Stephen Hillenburg and is voiced by Tom Kenny. 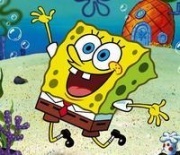 SpongeBob is a porous, yellow sponge with square pants, hence the name SpongeBob SquarePants. He has large blue eyes, each with three eyelashes, and two prominent front teeth. He also has three freckles on each cheek and dimples. He wears a white shirt with a red tie, brown trousers held up by a black belt and black shoes. He usually replaces the red tie for a bow tie for special occasions. SpongeBob has a very distinctive and high-pitched laugh. SpongeBob is a sea sponge, like his parents, but he is drawn to resemble a kitchen sponge. It is said that this because Hillenburg found this design to be more amusing. Although in several episodes he is shown to have a spine, he is extremely flexible and can bend in all directions. He can also absorb large amounts of water due to his porous body. SpongeBob was based on Hillenburg's first sponge kid, Bob the Sponge, who was the main star of the comic The Intertidal Zone. Bob the Sponge looked round, wears sunglasses,and looked extremely different from SpongeBob. Hillenburg shows the true birth of SpongeBob in an audio commentary special feature in Disc 3 in the SpongeBob SquarePants The Complete 1st Season Box Set. Also, the Intertidal Zone was starred with Rocky the Shrimp. Hillenburg reveals the creation of SpongeBob. SpongeBob was born on July 14, 1982. He is cheerful, good-natured and always happy to help anyone. He is kind to everyone and is determined to be friends with those around him. When it comes to doing a job SpongeBob completes it to the best of his ability, and gets extremely upset with himself if he fails to do something right. He is generally a happy-go-lucky character and is friendly to everyone. He is 30 years old which makes him a young adult but he and Patrick still show immaturity of young boys. SpongeBob lives in a Pineapple House in the town of Bikini Bottom, with his pet snail Gary. Next-door to him is Squidward Tentacles, who lives in an Easter Island head house. SpongeBob considers him very close friend, although this isn't mutual. Next-door to Squidward is Patrick Star, SpongeBob's very best friend, who lives under a rock. SpongeBob and Patrick have many hobbies. They both like Goofy Goober and spend a lot of time at Goofy Goober's Ice Cream Party Boat. SpongeBob and Patrick are both very immature adults, as they enjoy activities that are generally favored by children. As a result, Squidward has a strong dislike for both of them, as he considers himself more sophisticated and mature. SpongeBob sees Squidward as one of his closest friends, despite the fact that Squidward obviously does not share the feeling. This means that Squidward usually bears the brunt of SpongeBob's characteristics and actions, and is particularly annoyed by SpongeBob's laugh. Another very close friend of SpongeBob's is Sandy Cheeks. They both share a love of Karate, and are often shown trying to better each other by performing various moves. Squidward actually likes SpongeBob in some episodes and SpongeBob is delighted. SpongeBob is said to be an adult, but he has a very childlike manner he is not ashamed to enjoy things generally associated with younger children, such as cartoons and homemade cookies. He is not good at discerning sarcasm from sincerity, and, at times, is very literal-minded, which can lead to disaster for those around him. Despite these traits, his lightweight appearance, and his lack of physical strength, SpongeBob considers himself very mature, and has attempted – and failed – to prove his "manliness" on many occasions. SpongeBob has a career as a fry cook at the Krusty Krab restaurant. In spite of his meager salary (he once claimed that he is forced to pay his own boss) and the restaurant's poor working conditions, he is very proud of his trade. He is highly skilled at his job, and has won the Employee of the Month award hundreds of times. SpongeBob is always determined to please his boss, Eugene H. Krabs, who sometimes grows weary of SpongeBob's continuous enthusiasm. However, he is favored by Mr Krabs, because he is hard-working, and very good at his job guaranteeing Mr Krabs' high income. A running gag in the series is that SpongeBob is incapable of getting his driving license. He has attended Mrs. Puff's boating school for many years, and each year manages to fail his driving test. SpongeBob attributes this to nervousness behind the wheel; despite knowing how to drive, he loses his composure when driving, often ending in a car accident. 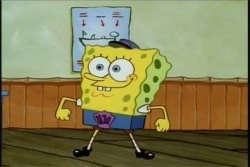 It is also revealed in the episodes Big Pink Loser and New Student Starfish that SpongeBob is a very well behaved person and in the episode Big Pink Loser, he has won hundreds awards for being excellent in excellence. In the episode New Student Starfish, SpongeBob has 74 good noodles stars. He also uses Sponge Gloss in the episode Picture Day, which looks like a girly bottle of lip-gloss. He once even became "normal" in the episode Not Normal by watching a documentation explaining who to be normal. As revealed in Party Pooper Pants, his Kindergarten teacher was Miss Shell. SpongeBob has many relatives that have looks of sea sponges and sink sponges. Sea sponges look like round cookies and sink sponges look like the washing sponge material in bathrooms and kitchens. Among his favorite activities besides the one Bubble Blowing and the art Karate also Jellyfishing. In the episode: I'm Your Biggest Fanatic, SpongeBob and Patrick went to the Bi-Annual Jellyfish Convention and saw many of their favourite jellyfish enthusiasts, such as Kevin the Sea Cucumber. He is a member of the Club of Jellyspotters and Mermaid Man and Barnacle Boy Fanclub. They love Jellyfishing so much, SpongeBob, Together with Patrick, he founded the Club SpongeBob with the leader, the Magic Conch Shell, in which both disguised with words communicate, and the Royal Club of good-neighborly Lodge. As said earlier, SpongeBob and Patrick love the Goofy Goober restaurant and they also enjoy watching The New Adventures Of Mermaid Man and Barnacle Boy on TV. He is also interested in Squidward's shirt as seen in: The Paper. 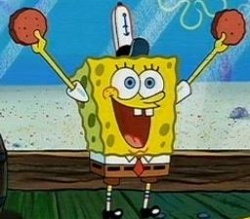 SpongeBob appears to like rock music, as he sang "Ripped pants" in the episode (Vocals & Guitar). In the SpongeBob movie he sang "Goofy goober rock" to destroy bucket-heads. In Lights, Camera, Pants! SpongeBob plays guitar and has a rock portion in "Atlantis SquarePantis" . He sings "Sweet Victory" in band geeks, he sings "Oh Baby" when he killed all of the scallops and saved Patty and was the vocals & acoustic guitar in the campfire song song. The creators of SpongeBob SquarePants have been attacked by some evangelical groups in the US because they see the character SpongeBob as homosexual, ever since the episode Rock-a-Bye-Bivalve, in which Patrick and SpongeBob were parenting a baby scallop. James Dobson of Focus on the Family accused the makers of a video in which SpongeBob appears with other cartoon characters meant to promote diversity and tolerance as promoting homosexuality. Creator of the character, Stephen Hillenburg, has denied that SpongeBob is gay and has said that he in fact thinks of him as asexual. Dobson later clarified his comments by saying his original complaints were not with the video, but with the We Are Family Foundation, who he says make available pro-homosexual material on their website. After the controversy, John H. Thomas, the United Church of Christ's general minister and president said they would welcome SpongeBob into their ministry. He said, "Jesus didn't turn people away. Neither do we." What people do not understand is that it is a joke which kids do not understand so the issue should not be identified as inappropriate. But Hillenburg referenced it once, when Mr. Krabs said "SpongeBoy me Bob!". It is copyrighted in The Flaming Carrot. SpongeBob and Patrick as babies. "You'll never guess what I found in my sock this morning! Go ahead, guess!" "Remember, licking doorknobs is illegal on other planets." "Sandy, you may not have noticed, but I is one hundred percent m-male." "What could be better than serving up smiles?" "It was his hat Mr. Krabs! He was number one!" "A rolling sponge gathers no barnacles." This page was last modified on 12 October 2013, at 19:30. This page has been accessed 346,000 times.